We have seen the Jollof Coconut Rice, this page is for the White Coconut Rice. I recommend the long grain parboiled rice because it is the rice that works best with the recipe detailed on this page. 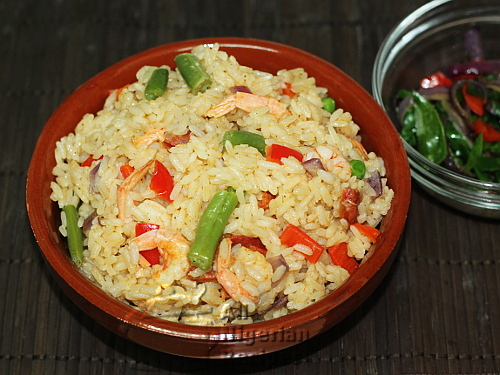 It is the best rice for all Nigerian one-pot rice recipes. You can use tinned coconut milk but I prefer coconut milk that I extract from the coconuts myself: How to Extract Coconut Milk. You get chicken stock by cooking chicken with seasoning cubes, thyme and onions and any other seasoning of your choice. Sometimes, I prepare Peppered Chicken or Grilled/Broiled Chicken for snacking on and I save the liquid (chicken stock) from boiling the chicken for recipes like this White Coconut Rice. We do not like shellfish in my home but those shrimps work well with the coconut taste. I recommend red onions for this meal because it adds some colour. Apart from that, any onions will work. 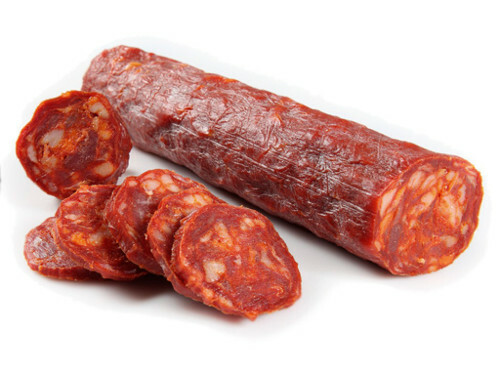 The sausage I used here is the Spanish tasty sausage known as chorizo (hard pork sausage). You can use any other type of dense sausage including hotdogs (Satis) which are more common in Nigeria. Chorizo really adds a delicious flavour to this meal. Use it if you can. The seasoning cube is optional because I already used seasoning cubes when cooking the chicken from where I got the chicken stock/broth. The green ingredients (peas and beans) are for colour. Feel free to use your favourite similar ingredients. If you want the coconut rice to be completely white with no single tint of colour like the one in the image above, do not use any ingredient that transfers colour. In that case, skip the tatashe peppers and hard port sausage. You can use pale looking sausages and hotdogs because they do not transfer colour. If you can, prepare the White Coconut Rice with all these ingredients listed above, please do so. It is so delicious! Get some chicken stock from cooking chicken. Parboil/Precook the long grain parboiled rice. Add it to a pot of a generous quantity of boiling water and cook on medium heat for 8-10 minutes. This time is for the quantity of rice stated in the list of ingredients. If yours is more, you will need more time. When done with the parboiling, you should be able to cut the grain of rice with your finger nails: no resistance or rubbery feel. Long grain parboiled rice contains lots of starch and is hard. When you cook this rice as is without first of all parboiling it (especially with rice recipes where ingredients are cooked in the same pot as the rice (one-pot rice recipes), the starch content will make the rice sticky and soggy. The hard nature will hamper its absorption of water, again leading to sticky, soggy and burnt rice when you are done. When we parboil/precook the rice, we reduce the starch content as some of it is poured away. Precooking also softens the rice to enable it absorb water easily. If parboiled correctly, the long grain parboiled rice will completely absorb the quantity of water that is at the same level as the parboiled rice. This is science. A practical example is when you want to use a bone dry rag to mop up water; what quantity of water can it absorb compared to when you are trying to mop up the water with a damp rag? When happy with the rice, pour in a sieve/colander and rinse with plenty of cool water to cool it down. Leave in the sieve/colander to drain. Cut the sausage into small cubes. Dice the peppers and cut the green beans into about 1 inch long pieces. Precook the shrimps and peel them or not depending on how you like them. Pour the chicken stock and coconut milk into a sizeable pot. Bear in mind that the rice will normally rise by at least one quarter of its quantity from the parboiled state to the done state. Add the black pepper and seasoning cube. Cover the pot and start cooking till it boils. Add the precooked rice, Stir and add salt to taste. At this point the liquid should be at the same level as the rice. If not, top it up with water. If the liquid is much more than the rice, you will end up with soggy coconut rice. If you used long grain parboiled rice and you parboiled/precooked it correctly, the Coconut Rice will be done by the time the level of water dries up. There will be no need to add more water. Cover the pot and start cooking on medium heat. Once it boils, add the hard pork sausage. The hard pork sausage needs to be cooked but if you are using another type of sausage that does not need much cooking, add it in step 6. When the water dries to exactly the same level as the rice (see video below), add the shrimps and continue cooking. When the water is almost dry, add the soft ingredients: onions, green beans and green peas and the tatashe and habanero peppers. Cover and continue cooking till all the water dries up. If you parboiled the rice correctly, it should be doen by now. Stir with a spatula till all the ingredients are well combined. That's it! The White Coconut Rice is best served on its own but feel free to serve it with Steamed Leafy Veggies or any other Nigerian Rice Accessory you like. If you have any questions about preparing the White Coconut Rice, click here to ask me.